Before making your pastry shell recipe you may want to think about what you need to make it for as there are different pastry recipes for this purpose. There are so many wonderful French pastry recipes but people are afraid to make the pastry! They don't know which is best. So here are a few tips for you. And please don't be afraid to try and make them – it is only practice that makes perfect. It's easy when you know how – and soon you will have the skills! For savoury pies and quiches or fruits with a very juicy nature such as plums, the pastry to use is the short crust pastry or the paté brisée. For sweet tarts such as lemon tart or raspberry tart etc. the paté brisée sucrée is the perfect one to use. · Prepare your flan tin by lightly greasing it. An 8 inch flan tin is suitable for most flans or quiches. 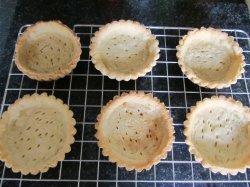 Choose smaller ones for individual tarts etc. A straight sided flan tin with a loose bottom is the best (more traditional) to use for a quiche. · Roll out your pastry just a little larger than the flan tin. To do this, you can reverse the pastry onto the rolling pin, hoping it won't break! Or you can fold it in half and then lay it in the tin and unfold it. Use your fingers to lift the edges of pastry and let it fill the entire tin. If it breaks, don't worry, just press it into the tin, it will still taste good. Make sure there are no large holes in the bottom or the filling will come through! · Use your rolling pin to roll over the top of the tin to trim off the edges. You can of course use a knife if you prefer. · At this stage make a decorative edge around the rim, if you're feeling artistic. Do this by using a knife to make small marks around the rim. · Prick the bottom of the pastry case with a fork. · Now at this stage you need to line the flan with a piece of lightly greased (with butter) paper or you can use foil and then fill it with dried beans. This is to prevent the bottom of the pastry case from puffing up when cooking. · Place in a preheated oven at 400 for about 8 minutes. 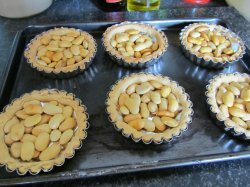 · Remove from the oven and remove the paper and beans. Place the shell back in the oven for about 2 minutes more (just starting to colour). · This is your partially cooked pastry shell. For a fully cooked pastry shell continue baking for another 5 minutes or until the pastry is a golden brown colour. Practice makes perfect with these French pastry recipes! Now that you have the perfect pastry shell recipe are you ready to practice? Let's start with a simple pastry using a cooked shell and an easy filling. This is a favourite of mine when I'm pushed for time! Strawberry Tart – French pastry recipes can be easy with something simple to start you off like this little gem. Mouthwatering summer strawberries with a delicious soft cheese filling. Enjoy! Creme Patissiere – For a more traditional filling for your strawberry tart or indeed any fruit tart, a delicous custard cream filling is what you need. This is very simple to make but again many are a little scared that it is too difficult to make or that it will go lumpy. No, indeed it is quite simple and if I can do it, you can do it too. Raspberry Tart – Here is another summer fruit tart for you to make with your French pastry recipes – a mouthwatering raspberry tart with a raspberry preserve glaze. Really yummy!